Work hard. Have fun. Make a difference. We strive to deliver all of these within our company, whether for our clients or for the community. 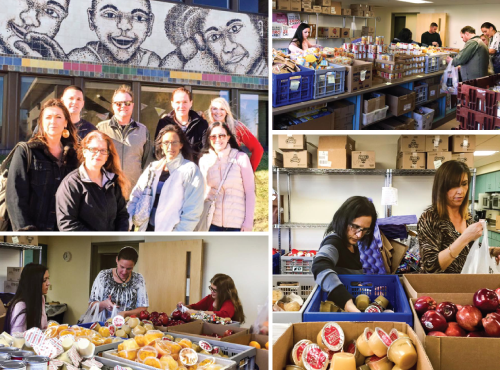 Here's a recap of community involvement efforts we've participated in throughout the past year! During the month of October, our employees raised $295 - which DP Management matched - and we were able to donate a total of $590 to Jewels of Autumn, an organization supporting the Breast Health Center of Excellence at CHI Health Lakeside. Our employees had the option of dressing casually on Wednesdays, so long as they donated $5 to the cause. By donating $20, they received a custom DP Management Breast Cancer Awareness t-shirt to wear on those casual Wednesdays. 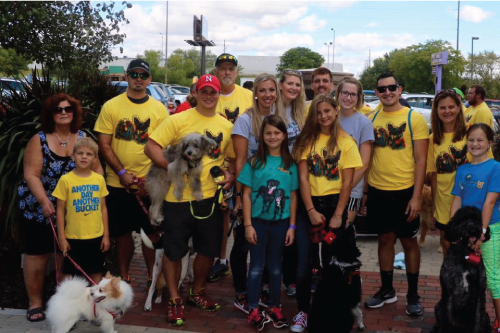 The DP Management “dog pack” consisted of DP Management employees, friends and family members. 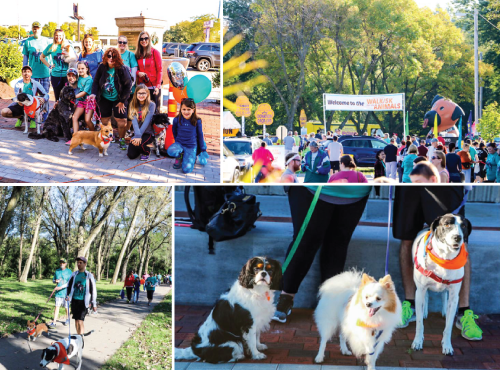 We had 15 total human walkers and seven furry friends participate in the 1K walk. Together, the DP Management Dog Pack was able to contribute $285 to the Nebraska Humane Society. 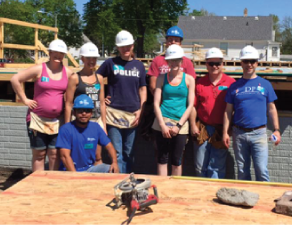 11 DP Management employees came out for a day to volunteer for Habitat for Humanity. We helped paint and do various other tasks to help build a house for someone in need. We enjoyed getting to know more about what Habitat does and how it supports our community in helping revitalize neighborhoods and giving families in need the opportunity to have affordable housing. We spent the morning volunteering at Completely KIDS stuffing bags for their Weekend Food Program. The program addresses childhood hunger in our metro area to ensure no kids go hungry over the weekend. This is a great cause we have supported in the past and are happy to continue volunteering our time to address this need. The DP Management team got out of work for the morning to wrap gifts for the Completely KIDS gift drive. We were so thankful for the opportunity to help out in "Santa's Workshop" and help put smiles on the faces of children in our community. A small group from the DP Management team spent an afternoon serving lunch at The Stephen Center. It was a humbling experience and we were so thankful for the opportunity to help out. 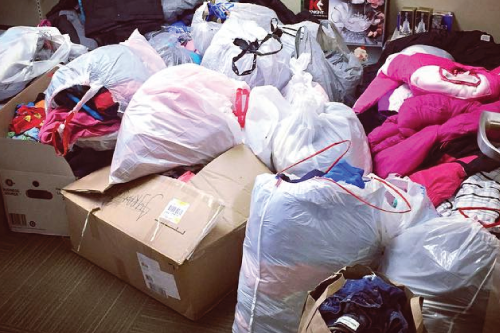 Throughout the month of November, our staff members brought in new and used clothing for children in need. We were able to donate a total of 21 bags and 4 boxes filled with winter clothes to the wonderful team at Completely KIDS. The DP Management “dog pack” consisted of DP Management employees, friends and family members. We had 15 total human walkers and five furry friends participate in the 1K walk. Together, the DP Management Dog Pack was able to contribute $375 to the Nebraska Humane Society. 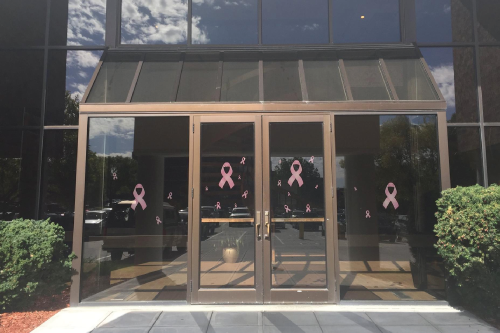 During the month of October, our staff raised money for Project Pink'd, a local charity dedicated to helping offer emotional, physical and financial support to breast cancer survivors. Our employees had the option of dressing casually on Wednesdays, so long as they donated $5 to the cause. Our donation of $320 was used to support programs benefiting breast cancer survivors in Nebraska & Western Iowa communities. DP Management employees came out for a day to volunteer for Habitat for Humanity. We helped build the frames of several houses near 3914 N 22nd Street in preparation for their Builders Blitz event. We volunteered from 8:30am-3:30pm. While it was hard work in the hot summer sun, we really enjoyed volunteering for such a great cause. Our Habitat leaders, Josh and Angel, were amazing and helpful. We enjoyed getting to know more about what Habitat does and how it supports our community in helping to revitalize neighborhoods and give families the opportunity to have affordable housing. For our annual meeting we had each of our properties make a patchwork no-sew blanket, where each square represented an employee at their property. We donated the blankets to Project Linus, an organization that makes and accepts donated blankets for critically ill children. 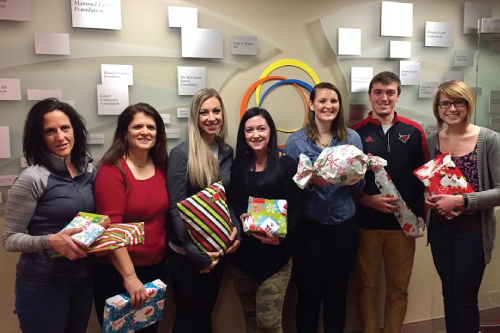 On December 8th, a handful of our employees volunteered during company time to wrap gifts as a part of the Completely KIDS Gift Wrap Drive. 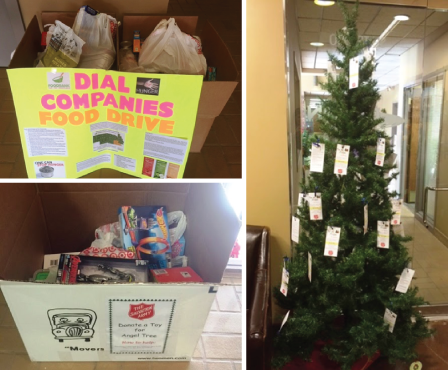 Throughout the months of November and December we had our annual Food Drive and Angel Tree Drive. For our annual Food Drive, we partnered with one of our residential properties, Cambridge Villas. We encouraged employees, family members, friends and residents to donate. Together we were able to donate 242 pounds of food, which was higher than 2014’s total of 210 pounds. The Food Drive was in support of Food Bank for the Heartland which serves most of Nebraska and parts of Iowa. With our annual Angel Tree Drive for the Salvation Army, we encouraged employees to take a tag off the tree to donate a toy to a child in need. We were able to fill one large box for a Salvation Army donation. 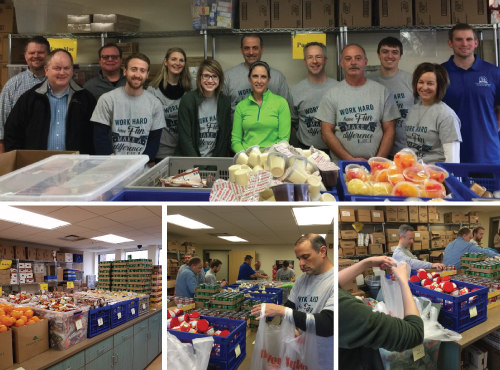 On November 19th, we volunteered to stuff bags for Completely KIDS' Weekend food program. Many of the children assisted by the program come from working families whose income is 200% below the poverty level. We were thankful for the opportunity to give back and stuffed over 300 bags in our two hour time slot! Throughout the month of October we ran a Facebook “Like” campaign to raise money for a local Breast Cancer Charity, Project Pink’d, pledging to donate $1 per new like. We raised $48 through Facebook and raised an additional $295 in employee donations. The company then rounded up the donation to $500. 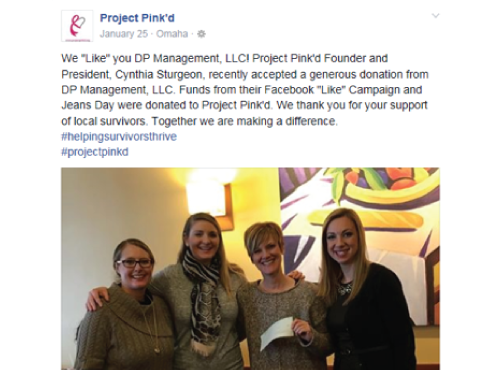 We met with the Project Pink’d founder and president, Cynthia Sturgeon, in January 2016 to present them with our donation. We enjoyed hearing the story behind why she founded the company as she saw a need for survivors to get support in the community after her own battle with breast cancer. We are proud to support such a great non-profit in our Omaha area. The DP Management “dog pack” consisted of DP Management employees, friends and family members. 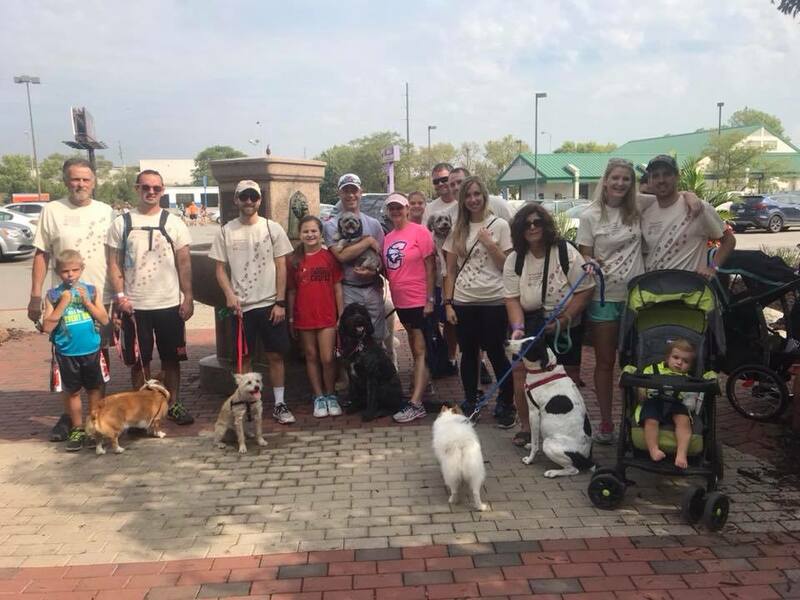 We had 11 total human walkers and six furry friends supporting the cause. 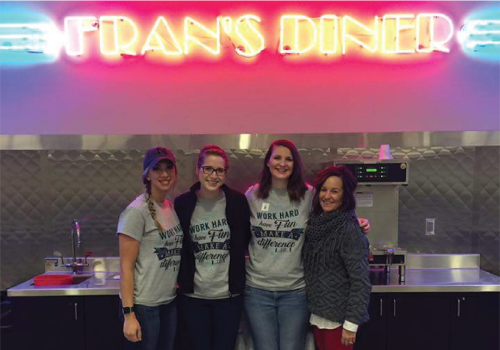 Leading up to the event, our staff raised money by having "jeans days," where participating employees would donate $5 for the cause. Together, the DP Management Dog Pack was able to raise $470 for the Nebraska Humane Society.